Hi all! I don’t know why I’ve never shot on this street before, it’s literally a few steps from my front door! Perhaps because it’s dangerous to dodge cars while trying to get a photo. I will admit I did find it to be a bit of fun. I have a strange love for danger. The other day I was riding my bike to work in the morning and saw the light rail coming. The crossing arms go down and I think now’s my time to gun it! (I totally do when driving too :/) I shouldn’t have gone because I got honked at by the light rail driver. I mean, was I asking for a death wish before 9 am?! I will blame that dumb move on it being early morning and my being late to work. As for the outfit, I went to visit my boyfriend at work on Sunday afternoon to get a bite for lunch. This outfit would be pretty basic but it you add a fun hat and some shoes with attitude you’re all set! Thanks so much for checking out my blog! Personally, I’m pretty sure I’d look like an idiot in a bowler hat- but you look so cute! I’m glad you were able to avoid death while taking blog photos haha. I did have a lot of fun on that hike. Thanks for your comment. You’ve made this tee and shorts outfit very fun. I love the edgy feel. The photos are really beautiful. Hello! I just came across your blog, and I love it! Your blog name is darling, and the few outfits I’ve seen on this page are just darling. 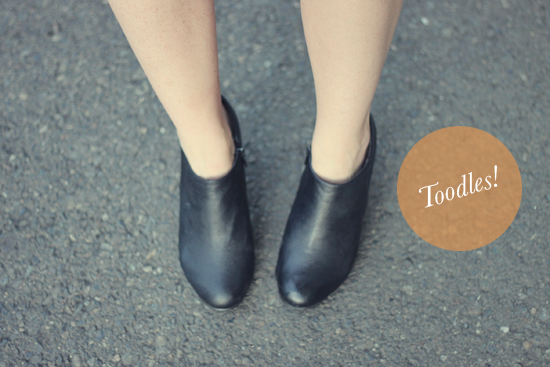 If you get a minute, I’d love to know what you think of my latest outfit post! While you’re visiting, follow along so we can keep in touch! 🙂 would you like to follow each other on instagram! It’s easier to keep track of posts and whatnot! Take care, doll! 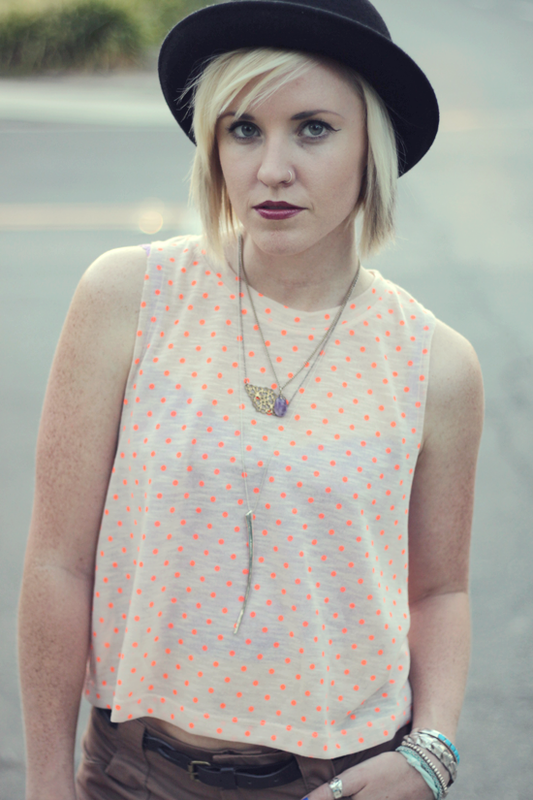 xo, elle | Living in Color.10 more days to enter the Stella & Dot Giveaway! LOVE your blog and your style!! Who takes your pictures?? I love the quality! Hello love, I just discovered your blog and I just love your style! 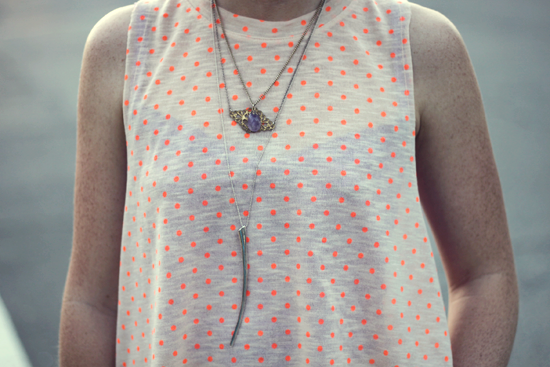 This polkadot top is perfection and I’m also obsessing over your lip color. It’s such a lovely, bold color! This is SUCH a cute look, I love all of your layered jewelry! Haha soooo cute! I could never pull off a bowler hat. Looks great on you though 🙂 Thanks so much for stopping by my blog, pretty lady! 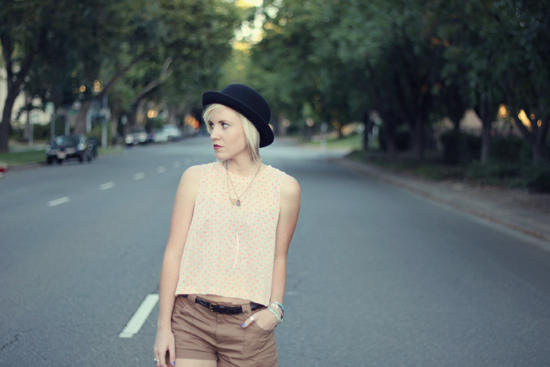 What a cute summer look, love the layered necklaces.